The History of American Civilization Program at the University of Delaware boasts many accomplished graduates currently working in a range of capacities at cultural heritage institutions and in academia. We sat down recently with Dr. Janneken Smucker (Am Civ ’10) to talk about what she’s been doing with her degree as an Assistant Professor of History at West Chester University. Here’s what she had to say. Am Civ: What attracted you to the University of Delaware’s History of American Civilization Program? What had you done before coming to UD? Janneken: Before I applied to the History of American Civilization program at UD, I had earned my MA in Textile History/Quilt Studies at the University of Nebraska-Lincoln, working with the International Quilt Study Center. I knew I wanted to continue to study objects, specifically quilts, but within broader contexts of consumer and visual culture. I sought a program in which my niche research interests would be taken seriously, where professors and other students would understand the merits of studying quilts. But I wanted comprehensive training in the field of American history to accompany my more narrow focus on material culture. UD’s AmCiv uniquely provides this. Am Civ: Your dissertation, which you published as Amish Quilts: Crafting an American Icon with Johns Hopkins University Press in 2013, gives readers a scholarly yet accessible take on the production and consumption of Amish quilts in American culture. In your book’s introduction, you explain that you are a fifth-generation Mennonite quiltmaker. How would you say your experience making the things you study has informed your research? Janneken: First of all, my hobby of making quilts inspired my interest in studying these objects. I didn’t even know the phrase “material culture,” but eventually figured out that I could combine quilts with my academic fields of History and Women’s Studies. 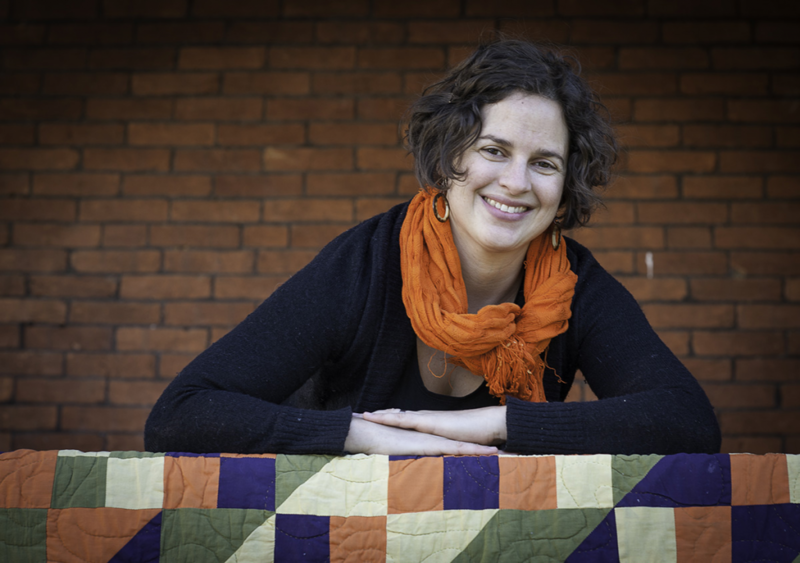 Because I make quilts—or at least did when I wasn’t frantically juggling being an Assistant Professor and mother—I understand the process of making choices, adapting patterns, adding personal touches, while maintaining aspects of tradition. I knew that quiltmaking is both an individual act and a communal one, and one influenced by many other media and forms of consumer culture. I find understanding the process an essential part of studying these objects. Am Civ: Before starting as a professor in the Department of History at West Chester University, you worked for Night Kitchen Interactive, a firm that works with museums and other cultural institutions on producing websites and other types of interactive experiences. Now, you teach courses in history as well as in digital humanities at West Chester University. How do you think digital tools enhance the study of the humanities among scholars and the public alike? Janneken: I am most interested in “public humanities” and how digital media and technologies can enhance public engagement with humanities content. New tools and platforms for disseminating historical and cultural content promote not just one-sided consumption of content, but participation and co-production of knowledge. Members of the public can share their own stories and perspectives, contribute by volunteering their own expertise through initiatives like Wikipedia, HistoryPin, and crowdsourced transcription projects. History should not be a conversation only among academics, but one that has relevancy to a broad public, and digital history helps make this possible. Am Civ: What projects are you working on now? Janneken: On campus I’ve been working with my colleague Professor Charles Hardy and students to create Goin’ North: Stories from the First Great Migration to Philadelphia. Our students created a digital archive of images and primary sources, detailed oral history indexes, and imaginative digital storytelling projects, which re-created the world southern newcomers encountered in early 20th-century Philadelphia. The Oral History Association named it the best non-print project of 2015, and we’re planning to expand the project, teaching the course again in Spring 2016. In my own research, I am continuing to investigate the role of quilts in American culture, analyzing how New Deal era governmental programs including the Farm Security Administration and the Works Progress Administration drew on the symbolic power of quilts to help advance the nation’s economic recovery. Am Civ: Do you have any words of wisdom for graduate students currently studying for advanced degrees in material culture studies? Janneken: I encourage students to think imaginatively about what their futures may hold by taking risks and pursuing unforeseen opportunities. We tend to enter grad school with a distinct vision of a future career; but actual paths during and after grad school may lead in unexpected directions. I took a low-paying internship upon defending my dissertation, and this position led me to develop a whole new skill set in digital technologies, which I would have missed if I had stuck to a more conventional path. Am Civ: Thanks again for taking the time to answer our questions, Janneken! Visit us at our UD Department of History Program web site. Header design adapted from Thomas Tuttell playing cards, England, 1701. Thomas Tuttell Mathematical Playing Cards Collection, Collection 220, 71x216. Courtesy, The Winterthur Library: Joseph Downs Collection of Manuscripts and Printed Ephemera.